One of the greatest threats to higher rainfall forests and agricultural areas in Hawaii is Miconia calvescens. It is the dominant plant in over 65% of the forest on Tahiti, French Polynesia. It was declared a noxious weed in the State of Hawaii in 1992. Infestations in Hawaii are too widespread for effective chemical/mechanical control on at least some of the islands on which they occur. Consequently, the Hawaii Department of Agriculture (HDOA), in cooperation with the Cooperative National Park Resources Studies Unit (CPSU) and the U.S. Forest Service/Institute of Pacific Islands Forestry (USFS/IPIF), has begun a program of classical biological control for this weed. Funding support from the CPSU has made this exploration possible. Robert Burkhart, HDOA exploratory entomologist, planned his exploration for natural enemies of this plant within its native range. His choices of sites were based on several factors, including herbarium records, ease of access, safety, knowledge, and past experience. He attempted to survey a variety of sites to find those with a high diversity of natural enemies. In his first effort, a wide selection on insects and, to a lesser extent, pathogens were shipped back to Hawaii. The intent was not to start cultures of every species, but to rear those that could survive in quarantine. Those that did not would undergo accession into the systematic reference collection. 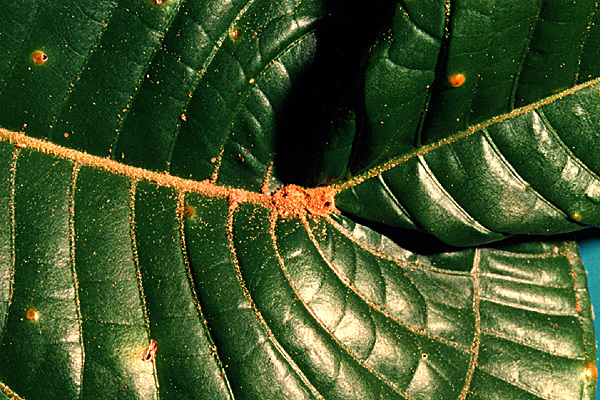 During the planning of his exploratory trip for natural enemies of Miconia, Burkhart obtained records from the herbarium, Smithsonian Institute, Washington, D.C., to determine potential collecting sites. Based on this information, ideas from cooperators, and his past experience in dealing with bureaucracies in the Neotropics, he chose Costa Rica as the most favorable collecting locality. 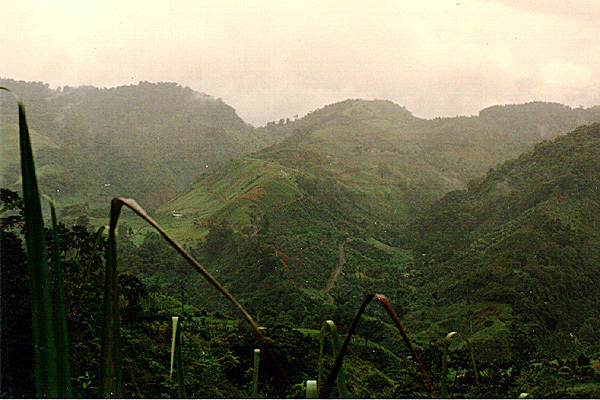 Burkharts first collections were made 20 km south and 20 km southeast of Turrialba (elevation 700-750 m), Costa Rica, beginning in mid-July of 1993. His collections were primarily of Lepidoptera and a few (about five) species of Coleoptera. Burkhart estimated that the shipment contained over 25 species, all of which had been observed feeding on M. calvescens. He mentioned that the diversity of insects was high, but numbers of individuals of any one species were low, so collecting was labor intensive. Because of the low numbers of specimens of each species in the shipment, we were unable to establish colonies of any of them in quarantine in Hawaii. Included in this shipment was a species of gregarious caterpillar (Euselasia sp. : Riodinidae; Figure 1) that looked promising to Burkhart. Observations in the HDOA Insect Quarantine Laboratory confirmed that these caterpillars were voracious leaf feeders. His second collection area was around San Vito, Costa Rica, (elevation 870-1230 m), from early to mid-August. He found that the M. calvescens in that area were purple under the leaves (similar to Hawaiis biotype), but only on young plants. His collections consisted primarily of Lepidoptera (14 species of micro-Lepidoptera and 7 species of macro-Lepidoptera, including Riodinidae), with some Coleoptera (possibly 9 species; mostly Chrysomelidae and Cerambycidae), and 2 Homoptera species (Membracidae). In late August through early September, Burkhart was in central and northern Costa Rica (elevation 570-660 m), including Arenal. 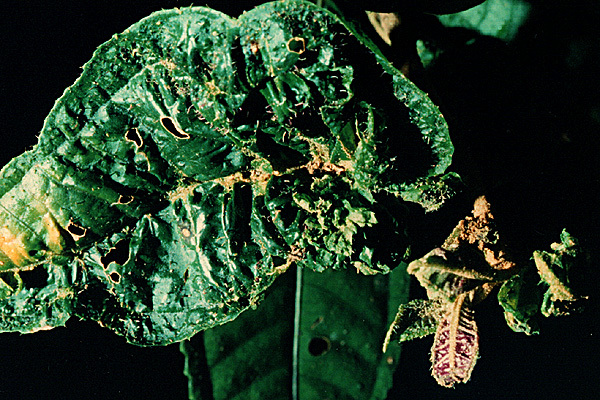 The next shipment included some plant pathogens, one of which has been identified as Cocostroma myconae. This leaf spot fungus appeared to Burkhart to have potential as a control agent. Unfortunately, neither it nor the few other pathogens sent in subsequent shipments could be successfully cultured in quarantine. This shipment consisted of a wide variety of Lepidoptera, including Euselasia sp. and species of Limacodidae, Nymphalidae, Lycaenidae, Noctuidae (Antiblemma sp. ), and approximately 33 other lepidopteran species (possibly including Notodontidae and Megalopygidae). An unusual fly-mimic, stem-boring weevil (Curculionidae) was also received in this shipment. The fourth and final shipment from Costa Rica by Burkhart was received on October 7, 1993. Collections were made between 15 and 20 km southeast of Turrialba (elevation 660-810 m). It was primarily composed of lepidoptera larvae with some adult beetles and larvae (mostly Chrysomelidae and Curculionidae). This shipment was held up in Los Angeles by an overzealous port of entry inspector, so most of the insects enclosed were received dead or moribund. The gregarious lepidopterans collected in Costa Rica were subsequently identified by Dr. Donald J. Harvey of the Smithsonian Institute as two species of Riodinidae: Euselasia chrysippe (Bates) and E. aurantiaca (Godman & Salvin). Although many eggs of these species were received, we could not get the emerged adults to feed nor mate. From conversations with Dr. Phillip DeVreis (now at the University of Oregon), we learned that these species probably require a large open sunlit area with vegetation around it to induce mating. These conditions would have been almost impossible to reproduce in the HDOA quarantine. A large quarantine greenhouse would have been required and even that might not be suitable. Only two (the Riodinidae) of the insect natural enemy specimens Burkhart collected have been identified as yet. He estimates that more than fifty species and six pathogens were collected during the short time he was in Costa Rica. Because of the large number of insect species collected, we have delayed getting them identified due to the expense and our desire not to burden overworked systematists unless we know that an insect has good potential as a control agent. Numbers of specimens of the majority of the species shipped to Hawaii were unfortunately small, so viable colonies could not be established. Should we receive funds to send Burkhart back for collections, he now has a good idea of where and what to collect and he could spend more time collecting promising species. Even though he found many parasitoids attacking these insects, he still saw noticeable damage to plants. This suggested to him that if the Miconia natural enemies were introduced to Hawaii and Tahiti, where they will be free from their own natural enemies, damage shoud be even greater. Just prior to the end of this exploratory trip, a stopover was made in Trinidad where a collection was made of the weevil Penestes n. sp. . A hundred adults were shipped to Hawaii. This weevil was originally studied by Burkhart for control of Clidemia hirta and, in the wild, does considerable damage to young seedlings. However, the larval stage required a succulent leaf petiole, which clidemia lacks. Miconia spp. petioles were attacked by these larvae in Trinidad, so presumably M. calvescens could be a good host. A total of 74 live adult weevils were received in the DOAs Quarantine Insectary. The weevils were often observed mating in the cages but unfortunately, no eggs or larvae were ever found and the colony eventually perished. It appears that M. calvescens is not a good host for this weevil or environmental conditions in quarantine prevented reproduction. 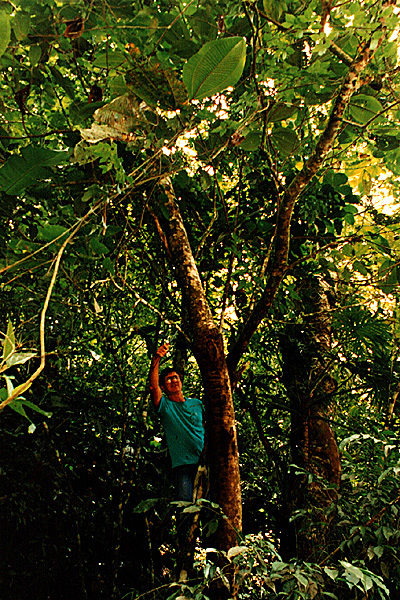 Burkhart mentioned in his correspondence that he has only explored a very small part of the native range of Miconia. New areas can be explored for new natural enemies that attack different parts of the plant. Southern Mexico and Guatemala may have an even richer biota associated with the plant, although the logistics and safety of working in those areas remain to be determined. 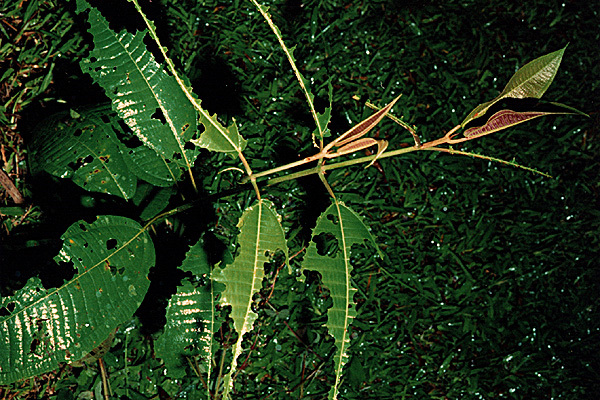 During Burkharts exploration in Brazil in January through April 1994, he made collections of diseased Miconia specimens and sent them to Hawaii. Upon receipt, the shipments were secured in the Plant Pathology Quarantine Facility for evaluation of the diseases and their causal organisms. 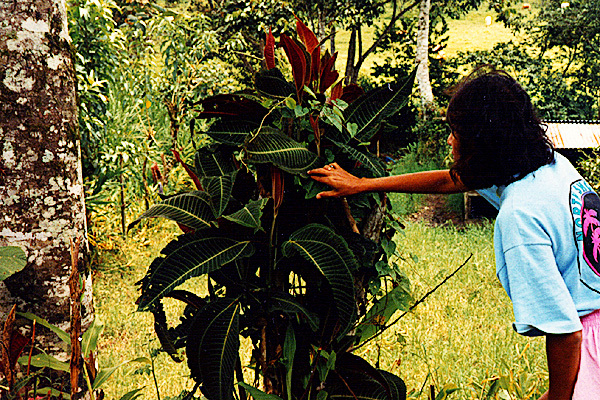 Three shipments of diseased specimens of Miconia had been received previously during Burkharts exploration in Costa Rica, conducted in August through October, 1993. In evaluating all of the specimens collected, HDOA plant pathologist Eloise Killgore highly recommends that two diseases of Miconia be investigated further. 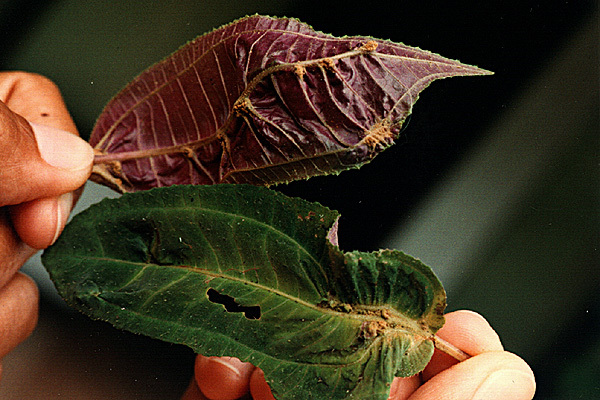 These are the leaf spot caused by Cocostroma myconae and the canker diseas, both collected in Costa Rica. 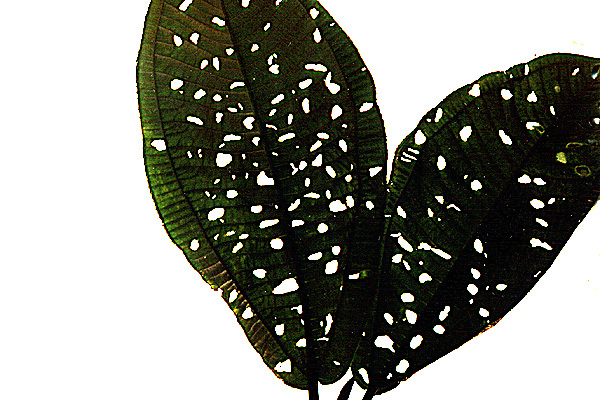 According to Burkharts descriptions, these diseases had the most impact on Miconia in the field. 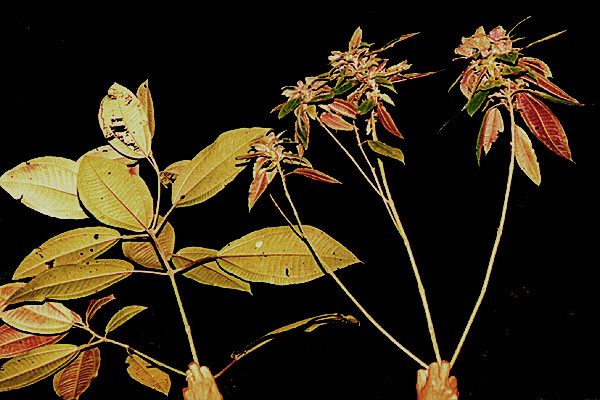 The following collection of photographs document the natural enemies of Miconia found by Burkhart in Central and South America. All photographs were taken by Robert Burkhart, Lystra Burkhart or Walter Nagamine. Exploratory entomologist in Miconia calvescens tree sawing branches for examination. Typical site. saa. 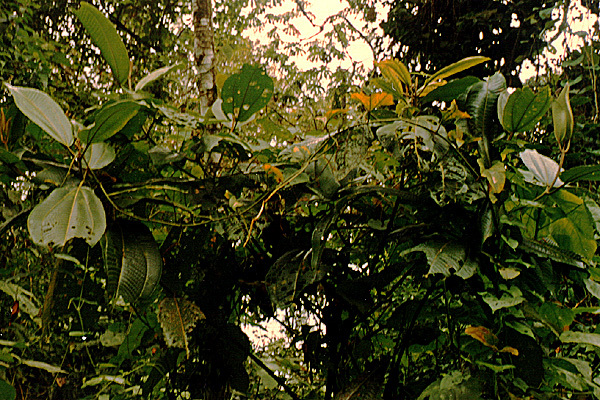 Overview of a good Miconia calvescens collecting site in upper left corner. Was a bushy pasture next to a forest. Plants usually grow at edge of forest. saa. Exploratory entomologist wading stream to reach Miconia calvescens collection area. 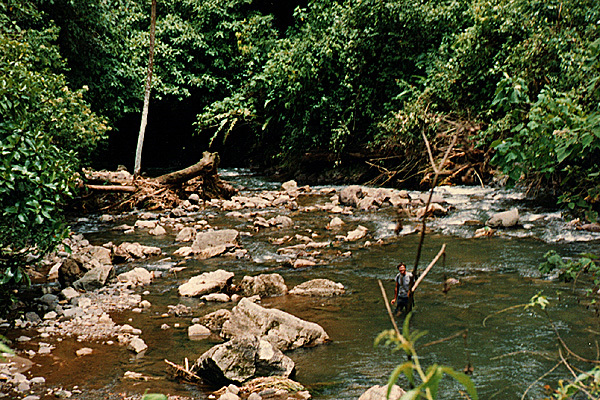 Along streams in forested areas were good collecting sites. saa. Miconia calvescens tree with heavy leaf damage. Late Aug., 1993 near Lake Arenal, Costa Rica 2100 ft. el. Miconia calvescens with major feeding damage from unknown agent. Also with possible leaf spot disease fungus Cocostroma myconae. 80 km NE of Rio de Janeiro, Brazil 150m. March, 1994. Pit galls on Miconia calvescens probably caused by an eriophyid mite. Condition rarely seen. Collected in late Aug., 1993 near Lake Arenal, Costa Rica 2000 ft. el. 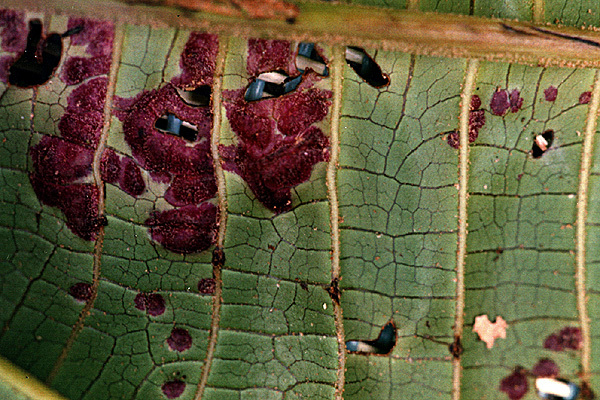 Feeding damage on terminal Miconia calvescens leaves by unknown insect. saa. Leaf galls on Miconia calvescens caused by unknown agent. Uncommon. saa. Miconia calvescens shown with the form which has leaves with purple underside. Plant was a fence post. Several coleopterous borers found in this plant. July, 1993. 20 km SE of Turrialba, Costa Rica 2300 ft. el. Normal Miconia calvescens on left and plant on right with rosette stunting due to unknown agent. Some associated mealybugs. Common in one area 80 km NE of Rio de Janeiro, Brazil 15 m elevation. March, 1994. Vein gall on Miconia calvescens, cause unknown. Rare. saa. Miconia calvescens with leaf deformation from unknown cause. Rare. saa. Miconia calvescens with leaf cutter ant damage. Uncommon. saa. 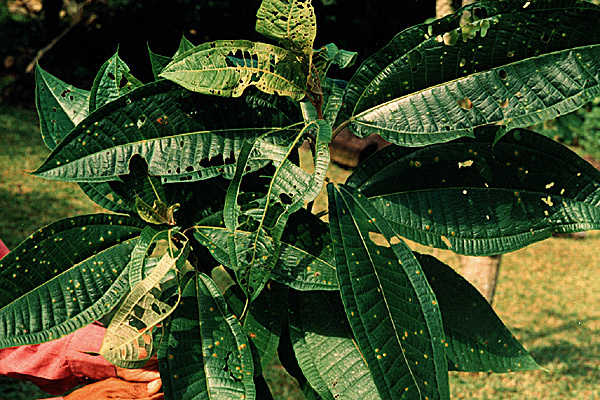 A large number of potential biological control agents for Miconia calvescens have been collected and are illustrated on a series of pages linked below.